We finished our learning journey in Block 2 right before Thanksgiving. Even though we say “finish,” we’re never really actually finished with discovering new things about learning topics. Sometimes, we find a natural ending point and then move on. That’s what we did with this block. One of Mrs. Baldwin’s favorite things to do with us is ask us what we learned during each block. 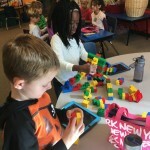 We think about the new things we learned, how we connected those things to what we already know, and even what we learned about LEARNING! In Block 2, we focused on the statement, “The way people live and work change over time.” When we first thought about that sentence, we immediately began discussing technology and all the ways it has made life different. We have grown up with different technologies that Mrs. Baldwin didn’t have when she was a kid, like cell phones, the internet, and even cars with automatic locks and windows! That conversation helped us think about different types of transportation and how they have changed over time. 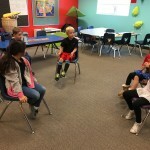 First, we had to define “transportation.” We know that the word includes cars and trains, but we learned that it is really about some way of moving people, animals, or “goods” from one place to another. 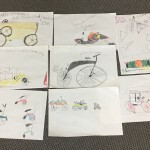 We created a list of different types of transportation that we already know, and then we did some research about transportation from the past. We spent a lot of time learning about older transportation that people made with their own hands – canoes and wagons were some of the first kinds! As we moved forward, we asked why transportation changed. 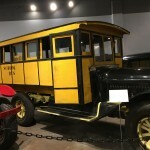 We know that inventions made transportation easier to go farther and farther, and as more people lived in certain areas, there were needs for transportation vehicles that could move more goods and more people. Some of us know that there are trains in Denver called the “Light Rail,” and they were built to help move people around. Buses do that, too. If more people are on trains or buses, then there are fewer cars on the roads. That means less pollution, too. When we learned about older kinds of transportation, we learned about water power, steam power, gas power, and electric power. 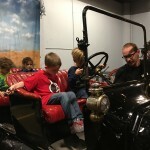 We visited the Forney Museum of Transportation (our blog post about that visit here). 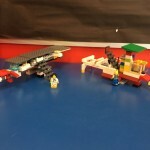 After we built those vehicles, we also thought about mass transportation for those same areas. You can’t just make the mass transportation vehicles – you also have to create stations for the people to FIND the mass transportation! We knew that because some of us have been to stations for the Denver Light Rail. This created some new questions for us. How could we build a station that floats on water but is always in the same place? That water team thought about using anchors and buoys to build their station. The snow station team designed a base that was like a giant snowshoe. They also thought that maybe they should include heaters, doors, and windows, because they don’t want people who are waiting to be too cold! That helped the desert team think that they should have air conditioning in their station AND inside their mass transportation vehicle. We had so many questions during this block! As we studied all the different types of powering vehicles, we kept hearing “internal combustion engines.” We wondered what that meant. We found a lot of videos that helped explain the 4 stage process of an internal combustion engine: Intake, Combustion, Power, Exhaust. It was so cool to see how that makes an engine go! As we thought back about our learning, we noticed we had to do a lot of exploration and research. 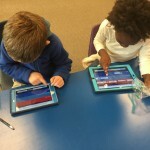 Some of us read books about transportation, and we all watched a lot of videos that helped explain these ideas in ways that we could understand. 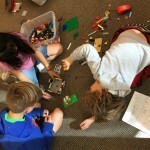 We also noticed that we learned better when we were able to build our ideas. 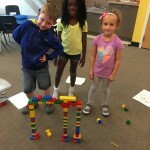 We used LEGO and Duplo blocks a LOT in this block! We wonder what YOU think about transportation? 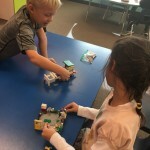 Do you like to build to learn? What other types of learning are best for you? We are currently in Block 2 at school: WHERE WE ARE IN PLACE AND TIME. Our statement right now is “The way people live and work has changed over time,” and we are focusing on how transportation has changed and impacted the way people live, eat, and travel. 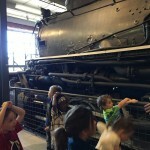 On Thursday, November 3, we were very fortunate to visit the Forney Museum of Transportation here in Denver. 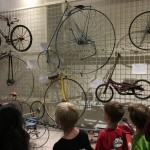 Our tour guide was Damion Cope, and he explained all of the very interesting types of transportation that are housed at the museum. We learned about so many different types of transportation. 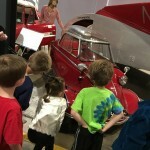 Some of our favorites were learning about how transportation has changed over time. 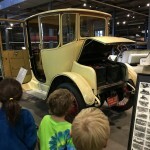 We saw examples of some of the very first motor cars – some were called “motor carriages.” They didn’t even have steering wheels! They just had levers to pull or push that would move the front wheels. 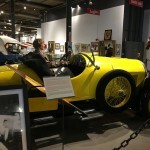 Some people think that electric cars are new to the 21st century, but we saw an electric car that was built in 1916. That was 100 years ago! It was called the Detroit Electric Opera Coupe. It had 4 big batteries, and it could go forwards or backwards – the seats turned around on the inside. 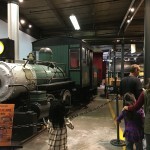 We also some real trains – INSIDE the museum! One of our favorites was the Big Boy! It’s a huge, black train. We also got to walk inside part of another train and see some of the different types of cars on passenger trains. Did you know that some people actually lived on trains? They traveled all across the country and wanted to have rooms on the train for living space. 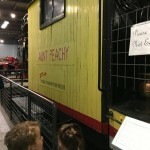 One of our favorite parts about the train section was “Aunt Peachey.” It was a train derrick that has a huge crane to help lift train cars, usually after a train went off the tracks. 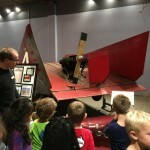 We also saw a lot of different experimental types of transportation. We really liked the plane that was turned into a boat. 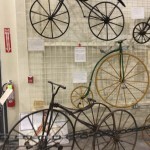 There were other airplanes, motorcycles, and bicycles – even an electric bicycle! 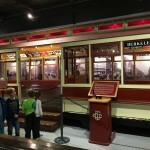 We saw covered wagons and trolleys – we couldn’t believe how many different types of transportation were in ONE museum! Mr. Damion helped us sit inside a helicopter – for most of us, this was the highlight of our trip. Almost every single one of us said we wanted our families to bring us back to the Forney Museum to visit again! Did you know that the Forney Museum has an interactive timeline on their website? It helped us to understand when certain inventions were made. 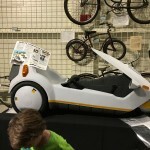 It was fun learning about how transportation has changed over time, and it helped us to think about how we could invent new types of transportation for the future! HT: I liked the Big Boy the best! 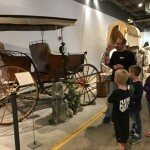 CRC: I liked seeing the covered wagon. They had horses and people with the wagons. The horse looked so cool. JF: My favorite was Aunt Peachy. If the trains go off the track, it can lift them up. 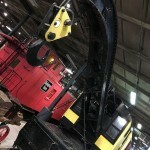 There was a face with eyes painted on the crane. KC: I liked the big train. It was called a steam engine. 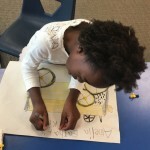 EO: I liked Amelia Earhart’s car. It was yellow, and I drew a picture of it. NK: It was fun to go inside the helicopter! CM: I liked sitting in the helicopter, too! SF: The train was my favorite. Damion showed us everything, and we loved all the stuff. 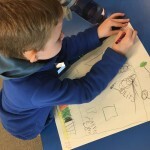 We journaled a lot about our trip, and then we decided to draw some photos of the vehicles we saw. You can see our drawings and photos of our trip in the photo gallery. Plane parts becoming a boat!